The Seahawks on Wednesday night were also reported to have signed free agent end/linebacker Dadi Nicolas. The Seahawks officially signed first-round pick Rashaad Penny on Wednesday while it was also learned the team is expected to sign free agent receiver/returner Keenan Reynolds, a former record-setting quarterback at Navy. The Seahawks also made another move Wednesday night, agreeing to terms with linebacker/defensive end Dadi Nicolas, a sixth-round pick of the Chiefs in 2016 out of Virginia Tech who has seen action in 11 games with Kansas City but with no tackles and one pass defense. All of his action came in 2016 as he missed last season because of a ruptured patella tendon. Nicolas was waived by the Chiefs earlier this month. A source confirmed to the Times the imminent signing of Nicolas, which was first reported by Ian Rapoport of NFL Media. Penny becomes the sixth of the team’s nine draft picks to sign. All picks get standard four-year deals with terms based on where they were drafted per the league’s Collective Bargaining Agreement. Penny’s contract is worth up to $10.7 million with a $5.9 million signing bonus. Teams can also exercise an option for a fifth-year on first-round picks at a dollar amount that will be determined later depending on the overall salary cap pool is at that time. For Penny, that means Seattle could keep him locked up through the 2022 season if it wants. Penny, who played at San Diego State, was taken with the 27th pick in the first round. It was also confirmed that the Seahawks will sign Reynolds, who rushed for 4,559 yards operating Navy’s famed triple-option offense, the most of any quarterback in FBS history, as well as 88 touchdowns, also an FBS record. Ian Rapoport of NFL Media first reported that Reynolds would sign. 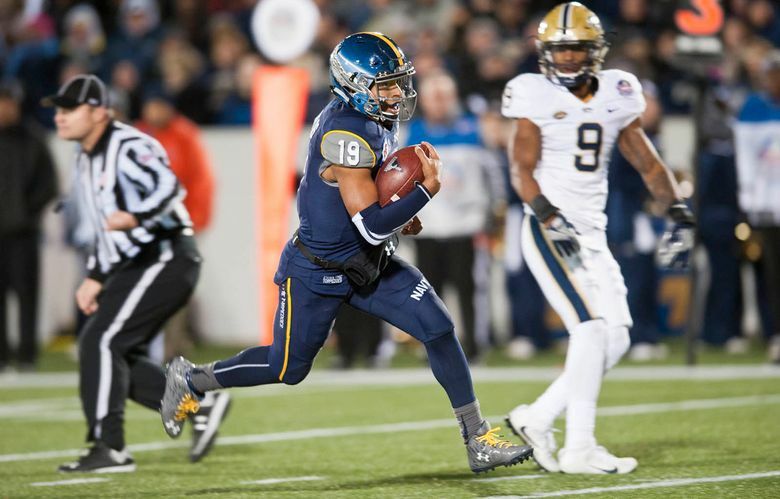 Reynolds was then given permission to play immediately as it was determined he could fulfill his commitment to the Navy by serving in the Navy Ready Reserve and was taken in the sixth round of the 2016 draft by the Ravens at 182 overall. With the Ravens he began a conversion to being a receiver/returner and it is expected he will also be tried by the Seahawks in those roles. The 5-10, 185-pounder has yet to play in an NFL game but was on the Ravens’ 53-man roster for one game in 2016. He then was waived prior to the 2017 season and spent some time on Washington’s practice squad last season. But he was not re-signed after the season and became a free agent. The Seahawks will have to make moves to clear spots for Reynolds and Nicholas on the 90-man roster, but those had not been announced as of Wednesday evening. Seattle has 10 other receivers on its current roster — Doug Baldwin, Tyler Lockett, Amara Darboh, Jaron Brown, David Moore, Tanner McEvoy, Cyril Grayson, Marcus Johnson, Damore’ea Stringfellow and Caleb Scott. Lockett is also the team’s primary returner but Penny is also expected to get a chance at kickoffs. Seattle’s only draft picks yet to sign are defensive lineman Rasheem Green, linebacker Shaquem Griffin and cornerback Tre Flowers.